Only in Ukraine....: UPDATE: You can only strike Outside of the mine! Not inside! UPDATE: You can only strike Outside of the mine! Not inside! 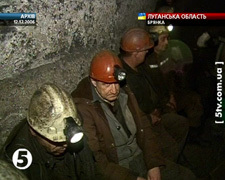 from their weeklong strike inside a mine shaft Thursday did not have the right to be on strike inside the shaft. Aryef’yev said miners are only allowed to strike outside the mine. Despite the fact that the Vice Deputy Coal Minister was able to convince the miners to stop their strike, the situation remains tense. The miners still haven’t received the almost 2 million hryvnia owed to them in backwages, and the former director of the mine is now under investigation. They emerged from the world below...Shahxteri! hm... banning Alcohol on New Years? Allo, A Chu tu chyesh mene?! i guess Its NOT his daughter! I guess Someone forget to clean the attic! Welcome to Halychyna Paramedic Rally 2006! !